When I was little, one of my favourite activities was to paddle around in streams and rock pools. Things haven’t really changed since then! One component of my job (and my favourite) is to wade up rivers to survey plants or get in the water and take samples of river ‘beasties’ using a net. I am privileged to work in Norfolk, my home county, with its unique chalk streams, wetland habitats and beautiful coast as an Environmental Monitoring Officer for the Environment Agency. I really enjoy the variety of my role, which includes working in the field, the laboratory and the office, but I especially enjoy getting out in the field and witnessing what is going on first hand. A key factor in my choice of career was that my mum worked as a chemist for the Public Analyst and she told me a story about her work analysing water from a stream to investigate what was affecting water quality. It was the local churchyard! Somehow this creepy story inspired me to take an interest in rivers and water quality. 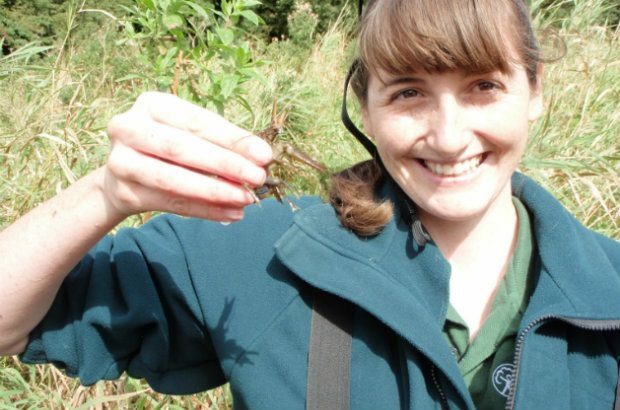 I trained as an ecologist specialising in freshwater ecology. In my team we monitor the health of rivers and lakes by looking at the invertebrate, plant and fish communities as well as water chemistry. I also respond to pollution incidents to assess the impacts of any pollutants released on local water bodies. We are essentially the data ‘powerhouse’ of the Environment Agency. The information we gather is used by other teams to make decisions on things that can affect water, such as discharge permits and abstraction licenses. It is really important to have good quality data we can trust. I’m interested in invasive species as they are the second greatest threat to biodiversity after climate change. Invasive species are animals and plants which have been introduced to this country by people and are causing problems. When we received a recent report of a type of invasive shrimp being found in part of the Broads, I found myself taking the lead on surveying to find out where they were present. This also led to us promoting the Check-Clean-Dry message widely to stop the spread of freshwater aquatic invasive species to different parts of the river catchments. In our area there are internationally important wetland habitats and rivers which we must protect. Due to the high number of visitors to the south east and numbers of people living here there is a risk of new introductions of invasive species. This can be prevented by taking good biosecurity measure, such as following Check-Clean-Dry. I have led events to increase awareness of invasive species amongst my colleagues and we now provide advice on Check-Clean-Dry when we correspond with our customers about water related activities. Taking the lead on invasive species and biosecurity in our area has meant I work more closely with other teams, and external organisations through partnerships, including Norfolk Non-native Species Initiative and River Waveney Floating Pennywort Partnership. I also check any sightings of invasive species that we receive through our apps Plant Tracker and Aqua Invaders. Information on the distribution of invasive species helps us to plan control programmes and assess the impacts of different species. I am lucky to have a diverse and rewarding role at the Environment Agency which helps to protect biodiversity and provides good water quality data to our teams to improve their work. I am looking for information on how to improve the water quality in our local park lake. the lake is 3 to5 feet deep,and surrounded by mature trees. There is an unnaturally large population of Canada geese ,which are fed too much bread by visitors. There are a few fish ,but no invertebrates in significant numbers. we never see amphibians,dragonflies ,caddis etc. The lake bed is thick with leaves.Would planting reeds or lily pads be beneficial?